Shinjuku is a very popular district among tourists to stay thanks to its convenient location and abundance of shopping, entertainment and sightseeing opportunities. Many excellent four and five star hotels are located among the skyscrapers on the station's west side, while many cheaper options are concentrated on the east side and around the Kabukicho red light district. A well maintained, large capsule hotel, ten minutes from the station. Men only. 5-star hotel featured in Lost in Translation, a 15 minute walk from the station. Usually the most affordable hotel in Shinjuku's skyscraper district. Asakusa is the recommended district to stay for low budget travelers with its wealth of inexpensive hostels, dormitories, budget ryokan and small hotels. It is also a great location for those looking for the old fashioned feel of Tokyo. Located a few subway stops off the Yamanote Line, it is neither the most convenient nor an inconvenient base for exploring the city. This hostel with dormitories and private rooms offers some of the cheapest beds in town. The largest hotel in Asakusa. Overlooking Sensoji Temple. Located directly next to Kaminarimon Gate, the symbol of Asakusa. One of the most popular hostels in Tokyo, located just a few steps from Kaminarimon Gate. Popular hostel, just a few steps from the Sensoji temple grounds. The Tokyo Station area is obviously a very convenient place to stay. Thanks to its central location, it is a convenient base to explore the entire city and offers easy access to/from Narita Airport. As the terminal station of multiple shinkansen lines, it also is the perfect base for long distance day trips. Several four and five star hotels are located adjacent to or in the close vicinity of the station, but low budget options are not available. 5-star hotel just a few steps south of Tokyo Station. This leading Japanese 5-star hotel is located a 5 minute walk from Yurakucho Station. By many considered Tokyo's finest hotel. A 4-star hotel just across the street from Tokyo Station. This 5-star hotel is located just a short walk from Yurakucho Station. A hotel in Roppongi will allow for easy enjoyment of the local nightlife scene. But also for the traveler uninterested in nightlife activities, the district's central location and choice of excellent hotels, make it worth considering. Roppongi is not located along the Yamanote Line, though. Popular 5-star hotel inside Roppongi Hills. One of Tokyo's most prestigious Japanese hotels. Shiodome is one of Tokyo's most pleasant and convenient places to stay. Centrally located, the modern city district offers multiple elegant hotels among its skyscrapers, as well as exciting dining options. The district's modern city planning allows hotel guests to reach Shiodome Subway Station and nearby Shimbashi Station on the Yamanote Line by covered or underground walking paths. Odaiba has a few very pleasant hotels, especially the Hotel Nikko Tokyo and Grand Pacific Le Daiba, that come with a certain resort atmosphere. The area's downside as a base is its somewhat isolated location from the rest of the city. Centrally located hotel with good valued rooms. Popular, conveniently located hotel with spectacular views over Tokyo Bay. Most convenient hotel for visiting the Tokyo Big Sight convention facility. Due to the inconvenient early-morning departures and late-night arrivals of many international flights, hotels around Haneda Airport are popular among foreign travelers to spend their last respectively first night in Japan. Each terminal building contains a hotel, and many more are located a short shuttle bus or train ride away. Shinagawa, a direct 20 minute train ride from the airport, is another popular place to stay among airport users. Hotel inside the domestic terminal 2 building of Haneda Airport. Located near the airport and connected with it by free shuttle buses. Hotel inside the international terminal of Haneda Airport. Shinagawa does not have much sightseeing to offer, but it is among Tokyo's most convenient districts to stay in terms of transportation. Shinagawa Station is not only located along the Yamanote Line, but also offers direct connections to both of Tokyo's airports, and is served by the Tokaido Shinkansen, the high speed train line to Kyoto and Osaka. The trend setting district of Shibuya offers several hotels to those wishing to conveniently enjoy the district's many shopping and nightlife options. But Shibuya's location along the Yamanote Line and multiple subway lines, also make it a convenient base to explore the entire city. The Tokyu corporation runs not only a lot of Shibuya's shopping facilities, but also three of the district's most prominent and convenient hotels, all located within short walks of the station. However, Shibuya does not offer many low budget choices. Unconventional lodging can be found on the Love Hotel Hill. A quality level higher, but slightly less centrally located than the other Tokyu hotels in Shibuya. Google Japan is headquartered in the same building complex. Directly connected with Shibuya Station and located within the attractive, recently opened constructed Shibuya Mark City complex, this is Shibuya's most convenient hotel. 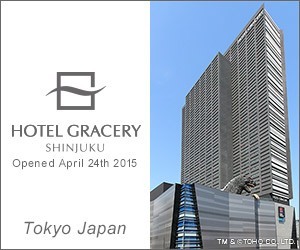 Very centrally located, this is the most inexpensive of the Tokyu hotels in Shibuya. The Ginza is a good location for those seeking easy access to the district's many shopping, dining and night life options. Located a 15-20 minute walk from Tokyo Station and the Yamanote Line, it is neither the most convenient nor an inconvenient place to base oneself. High to medium budget options are ample, but low budget options are hard to find. Ikebukuro is not Tokyo's best reputed district, but its location around the city's second biggest train station makes it a convenient place to stay. Ikebukuro is among the cheapest places along the Yamanote Line, and offers low budget options as well as comfortable three and four star hotels. Good value for its convenient location adjacent to Ikebukuro Station. One of the most affordable options in Ikebukuro, a 5-10 minute walk from the station. Located inside the popular Sunshine City complex in Ikebukuro. A small number of hotels around Akihabara Station and across the district offer the ideal choice for those seeking proximity to Akihabara's otaku culture. Its location along the Yamanote Line makes Akihabara also a convenient base to explore the rest of Tokyo. Reliable business hotel just a short walk from Akihabara Station. Business hotel with large bath near Suehirocho Station. Chic hotel adjacent to Akihabara Station. Ueno offers several low and medium budget hotels and is convenient for access to/from Narita Airport. Located along the Yamanote Line and the Tohoku, Joetsu and Hokuriku Shinkansen, it is a convenient base for exploring the city and for side trips to the northern Kanto Region, the Tohoku Region, Niigata and Nagano. Recently opened hotel with excellent location right in front of Ueno Station. Although the themeparks are not too far outside of central Tokyo, visitors to Tokyo Disney Resort may find it more convenient and fun to stay at one the various hotels found around the resort. The three Disney Hotels are the most popular and convenient, and offer guests some special benefits. The Tokyo Disneyland Hotel is the resort's newest Disney Hotel, located in a Victorian themed building just across from the entrance to Tokyo Disneyland. The first Disney Hotel to open at Tokyo Disney Resort, it is located next to the Ikspiari shopping mall, about halfway between Tokyo Disneyland and Tokyo DisneySea. Standing partially inside Tokyo DisneySea, the MiraCosta is the resort's most unique hotel with views into the park from many of its rooms. Guests enjoy early entry on selected days.